MASKerade: Inspired by Laura. And Kate. Inspired by Laura. And Kate. Anyway, fast forward to last week, when Kate and her friends were in my craft room, playing with distress inks and stencils. They loved it! Kate made a polka dot background with Festive Berries, Mowed Lawn and Peacock Feathers. That colour combination caught my attention and reminded me of Christmas, and this card has been working itself out in my brain ever since. I love that even though I used circles, I get a plaid or argyle feeling from the pattern. It looks better in real life, but it's pretty dark. So I went back to the drawing board (pencilling lines to help me position the overlapping circles) and then stamping a Papertrey sentiment with Unicorn White and embossing with White ep. Still not my favourite technique. Maybe I'll try one (hundred) more time, stamping the colours off for a softer effect? I'll let you know. Really like the white one. Very rich and complex, while still simple. Really nice. Ohhh, Ardyth, these are awesome! I certainly love the CAS feel of both, but I love the way the white stands out! Great work! Both are stunners - would like to see the other 399 in your bin to know what didn't work. You're right about the plaid/argyle pattern (which gives me an idea) - not sure I'd have your patience though. Love love love this Ardyth. I too fell in love with Laura's card. I want some "just for fun" time to play and try this. I cannot believe how perfectly lined up your circles are - they look amazing! I really like both of these. It's interesting how changing the order of the colours makes each one so different. I love that Stampabilities sentiment too! It's interesting that something that seems so simple can be so difficult to do. I would have given up after 5 or 6 tries. I'm glad you stuck with it because both cards are terrific. I LOVE this...the white sentiment on top of the gorgeous spectrum of colors is perfect. And I feel your pain on the 339 items in the trash. I'd be right there with you! I definitely like the color balance better on the white embossed card. I love Laura's card, but you truly took the idea and made it something completely different. 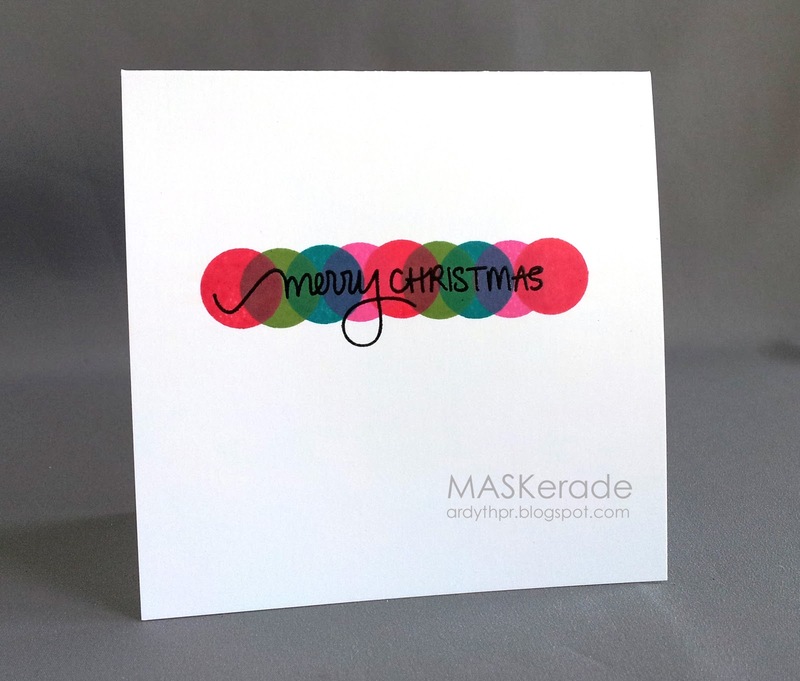 Such a great take on the card, love the intense colours and the beautiful sentiment. Your circles are perfect. I love the pop of the white sentiment in particular. I've often wondered why I don't own more light colored inks. Maybe it's because companies don't sell them as much, thinking people will be disappointed that they don't "work" as well?! It seems on every other card I make I'm wishing the colors would be a little less saturated. Stamping off would help, thanks for the reminder. All that said, I do love how your card turned out, and especially how you were inspired by Kate! Good call on switching to the white sentiment. Excellent stamping. I'm always happy to hear others making more than one or two versions of their cards! Oh gosh I just love this Ardyth! 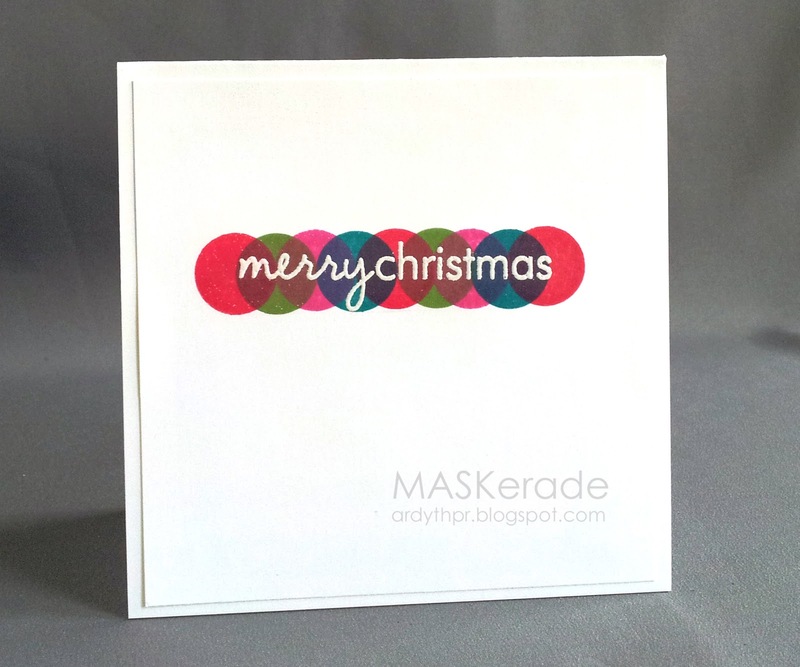 The overlapping colored circles with the embossed white sentiment looks amazing!! This turned out really great! I'm sure it was tricky to do. All those overlapping circles... I'd be sure to make many mistakes.